Ten episodes of Borgen fly past when they’re aired two a week, and while I do enjoy the intensity I wish they’d space them out a little more because just as I remember how superb the show is, it’s gone again. The life of the prime minister is never gonna exactly be a walk in the part, but everything does rather seem to conspire against Birgitte, and she doesn’t make life easy for herself either. More than once I found myself shouting at the screen “No Birgitte, don’t make that ultimatum”, “No, Birgitte, don’t invite the attractive chauffeur in to fix the sink. No! Bad Birgitte, put him down!”. More so than in the first season it’s not just with hindsight that decisions are unfortunate, often you could see exactly where it was all heading and could scribble out the rest of the key events by the time the teaser had finished. I wasn’t all that keen on several of the storylines. Too many episodes were more focussed on foreign affairs than home issues and even though the national repercussions were discussed I would prefer a more internal focus. Looking at Denmark’s presence in Afghanistan was interesting (although maybe not the best way to kick off the season), but I lost a bit of interest with the European Union stuff and was frustrated at losing two episodes to seeking peace in a made up African country in the middle of a civil war. Oh and yet again there was a Very Special episode flashbacking to Kasper’s child hood which has a very different tone to the rest of the series and just doesn’t really gel with the rest of the episodes. I’m not even sure how I feel about the characters, they’re certainly interesting and have motivations that are understandable even if I don’t agree with them, but there aren’t many of them that I like. Kasper and Katrine circle endlessly round each other making poor decisions, the politicians are mostly selfish and petty, some of the media come across slightly better but others are truly hateful and various family members seem incapable of empathy. Even Birgitte spends much of the season as a quite unpleasant Politician, selling out people that she appeared to be friendly with, ignoring family issues and generally completely blinkered towards keeping her increasingly unstable job. So why do I love the show so much, if I’ve got all these issues with it? Well it doesn’t really matter if you like characters if they’re believable and well written, uninteresting storylines can be overlooked if the dialogue sparkles and predictability doesn’t matter if the director finds interesting framing, lighting and beautiful sets. Even Birgitte redeemed herself in the last couple of episodes, until I was cheering her outloud at the end of the final episode. The last few scenes had the kind of eloquence, team work and elegance that is unmistakable to West Wing fans. 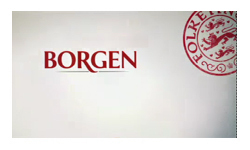 Borgen remains one of my favourite shows. It makes me laugh, it makes me think, it makes me care, and it makes me look things up on Wikipedia. 10 episodes is nowhere near enough, I can’t wait for the next season.